I love peaches. My grandfather was a peach farmer and so I grew up associating summer with juicy South Carolina peaches. The last few years have been hit or miss for local peach farmers, with late freezes wiping out much of the crop, or drought leading to low yields and high prices. Grilled Peach and Steak Salad is a great entree salad that you can make indoors or out. Instead of using tomatoes, make a fresh salsa using peaches. Combine one finely diced onion (you can soak it in ice water for 10 minutes to tame the bite before draining and adding to the other ingredients), one finely diced green pepper, minced jalapeno to taste, a minced or pressed clove of garlic, a sprinkle each of cumin, chili powder, and salt, and the juice of half a lime to 3 or 4 peeled, pitted and diced peaches. Cover and chill for a few hours before serving with chicken, fish, or chips. I’ll have a recipe post up for Peachy BBQ Chicken soon, with pictures, but it couldn’t be easier. Peel, pit, and dice about a half dozen peaches. Cook them down in a saucepan, maybe with a spoonful of peach preserves if you have them. Once they’re soft and cooked down, add the entire bottle of your favorite bbq sauce. Let simmer and reduce for a half hour or so over medium-low heat, then brush on to baking or grilling chicken about 2/3 of the way through cooking. Serve with additional sauce on the side. I haven’t tried this Southern Living Peach Cobbler recipe, but it’s in my To-Make pile. Very highly rated on the site, and looks easy-peasy. Hmm…I do have a few dozen peaches staring at me. Maybe I’ll make it this week. Use up some peaches and have some healthy whole grains while you’re at it. The Peach-Oatmeal bread from KAF’s Whole Grain Baking book is a great quick bread recipe. I’ve made it, but I didn’t take any pictures, and KAF doesn’t have the recipe on their site. So if you’d like to make it before I get around to posting pics and instructions, the Slow Like Honey blog has the recipe and photos. Who wouldn’t love a little gift basket of peaches? If you really have more than you can use, spread the wealth! It beats overloading friends with zucchini from your garden! How do you like to eat your peaches? Have any favorite recipes to share? Let me know in the comments! wow! I didn’t even know you could grill peaches! We had a peach tree at our last house. Unfortunately, by the time I figured out how to care for it, it was killed by lightning. I’m going to have to pick up some peaches and give some of your suggestions a try! They are AWESOME grilled! I’d love to grow my own but seeing my local farmer struggle with them it’s not worth it. I’m a haphazard food gardener. It’s so hot in July that I’d rather shop at the farmer’s market than water my plants! 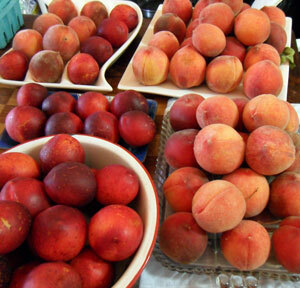 If you buy peaches at the grocery store, let them sit at room temp a few days until they start to get soft. They’re too tart when they’re underripe. Let me know how it goes! Oh, man, we love peaches around here, but we rarely do anything but eat them plain. I did try the Cook’s Illustrated Perfect Peach Cobbler, and it was pretty darn good, and I do adore peach ice cream, but I’ve not made it yet. We make a lot of ice cream, so I should try peach soon. If you do only one thing, I’d recommend the BBQ sauce. Especially if you use a spicy brand, it’ll have a sweet and spicy kick that’s divine. I eat most of my peaches just in a bowl by themselves or with other summer fruit, but when I have so many I can’t eat them fast enough, I’ll pull out a couple of these recipes. Will do. I do love sweet barbecue sauce, so it’s probably a winner. Thanks! I have a big half bushel and want to keep them, so your page here is great! 1) A friend says she puréed them and freezes them in little ice cube trays, then stores the cubes. If you are having champagne, you can drop in a cube of peach and make an even better cocktail. 2) macerated peaches are great over vanilla I’ve cream. Slice ripe peaches and put in a bowl and stir in some sugar and balsamic vinegar. Let sit covered on your counter for about 30-60 min. Then you have a divine sauce for ice cream or yogurt.